Friends of Brown Street Park: Earth Day was a Success! Thank you for participating in EARTH DAY 2010! 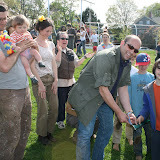 We cut the ribbon for the new Community Garden...planted 5 new trees and spruced up.. everything!! !